The Ministry of Electricity on Wednesday, signing a contract with the company "General Electric" American for the maintenance and operation of the second south of Baghdad gas station to add 209 megawatts to the national system, stressing that the implementation of this contract will reduce the hours of cutting and increases citizens equipped with electricity. A spokesman for the Ministry of Electricity Musab teacher, in a statement received (range Press), a copy of it, that "the Directorate General for the production of electrical power, the central region entered into a contract with the US General Electric Company for the maintenance and operation of the second south of Baghdad gas station in Baghdad province," noting that "processing contract includes the installation and operation (8) generating units and gas type (Frame 5) at the station, and the design capacity of (26.2 MW) per unit." He said the teacher, said: "This contract is part of a US loan and the duration of the implementation of (300 days), to add to the national electricity system energy of (209 MW)," adding, that "the implementation of this contract will contribute Brphi national system of new obstetric cards, and thus reduce the hours of cutting and increase citizens equipped with electricity. " The Ministry of Electricity announced in (the 25th of January 2016), its agreement with GE worth about $ 328 million to increase the rate of a thousand megawatts of electricity production, indicating that it contained material processing maintenance of the generating units of gas stations Khairat, Karbala and Najibiyah Shatt al-Basra, south of Baghdad, the first Jerusalem and Alhaidariya, Najaf and Diwaniyah, as well as processing and installation engines units (LM6000) for Musayyib stations and invading Jerusalem, processing, installation and unit fuel reprocessing plant Diwaniyah gas, and the rehabilitation and installation of plant Bazargan gas engine. Iraq has suffered a shortage of electric power since the beginning of the year 1990, but the past three years have seen an improvement in the provision of electric power after the opening of a number of power stations which (Zubaydiah in Wasit and good deeds in Karbala and Alhaidariya in Najaf and the station gas in Maysan and two stations in Diwaniya station al-Sadr in Baghdad and the Shatt al-Arab stations and Rumaila in Basra and gas station in Kirkuk), where operating hours continue to about 20 private hour with low temperatures in the operating hours are shrinking dramatically with higher temperatures and increased loads on the power plants during peak times. All is well and riding the comet! Another couple of articles confirming the contract with General electric in the news today. General Electric has secured more than $1.4 billion in orders from Iraq’s Ministry of Electricity to set up power plants totalling over 2 GW as well as provide technology upgrades and maintenance services. In detail, GE is to set up the Samawa and Dhi Qar Power Plants, which will have a combined capacity of 1.5 GW. In the first phase of the project, GE will install four 9E gas turbines in simple cycle at each site by 2018. The second phase will entail the combined cycle conversion of the 9E units, GE said. The Iraq’s Ministry of Electricity has awarded contracts worth more than $1.4bn to GE to build power plants as well as provide technology upgrades and maintenance services for the existing power infrastructures in the country. Under the contracts, GE will build Samawa and Dhi Qar power plants, which will have a combined capacity of 1,500MW. The company will initially install four 9E gas turbines in simple cycle at each of the power generation facilities by 2018. The second phase involves combined cycle conversion of the 9E units. GE, which will serve as the engineering, procurement and construction (EPC) contractor for the projects, will also be responsible for the supply of advanced heat recovery steam generators (HRSG) and steam turbine technology. Additionally, the company agreed to add over 580MW of generation capacity to the national grid through upgrade and rehabilitation works at four power plants. 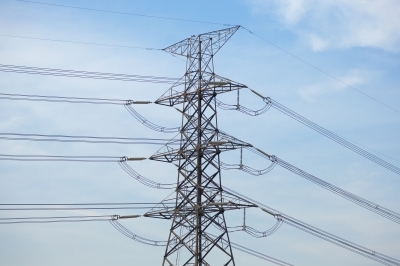 The work is part of Phase II of the Power Up Plan, a Iraqi Ministry of Electricity’s initiative for critical electricity generation and maintenance projects. In order to help enhance the reliability and efficiency of installed base, GE will undertake maintenance of 9E gas turbines across six power plants in Iraq. The work will help sustain ~1.75GW of existing power generation. Iraqi Ministry of Electricity official spokesman Musaab al-Mudarris said: “Today’s announcement with GE is another strong statement on our commitment to strengthen the nation’s power infrastructure. In 2016, GE developed more than 700MW of additional power through existing power generation infrastructure as part of the Power Up Plan’s Phase I. Twilight News / took place on Thursday the signing of the contract to build power generation stations in the provinces of Dhi Qar, Muthanna, with a total capacity of 1500 megawatts at a rate of 750 MW each station and at a total cost of $ billion and 49.4 million dollars ceremony. According to a statement to the Iraqi government, it will be through a contract to provide jobs for Iraqis and the company pledged to maintenance of existing plants , which helps to provide two thousand megawatts. The contract was signed by the Iraqi government and the Minister of Electricity Qassim Mohammed Fahdawi and General Electric Company CEO Steve Jolles of the energy sector in the company, and the presence of government Reese Haider al - Abadi. Iraq and the US signed on Thursday a contract for the establishment of two power plants in the provinces of Dhi Qar, Muthanna, with a capacity 1500 MW at a cost of more than a billion dollars. A statement by the Office of the Prime Minister Haider al-Abadi received (range Press), a copy of it, that "the Prime Minister Haider al-Abadi, attended on Thursday, the signing ceremony of the contract to build stations generating electricity in the provinces of Dhi Qar, Muthanna, with a total capacity 1500 MW at a rate of 750 MW each station and at a total cost of $ one billion and 49 million 400 thousand dollars. " The statement added that "the contract will provide job opportunities for Iraqis, which the company undertakes maintenance of existing plants, which helps to provide two thousand megawatts. The contract was signed by the Iraqi government and the Minister of Electricity Qassim Mohammed Fahdawi and General Electric Company Mr. Steve Jolles, chief executive of the energy sector in the company. Iraq has signed a contract to set up stations to generate electricity in the provinces of Dhi Qar, Muthanna , at a cost of more than a billion dollars. A statement by the prime minister 's office received by all of Iraq [where] a copy of the "blessing of Prime Minister Haider al - Abadi took place on Thursday the signing of the contract to build stations generating electricity in the provinces of Dhi Qar, Muthanna, with a total capacity 1500 MW at a rate of 750 MW each station and a total cost of ceremony the amount of one billion and 49 million 400 thousand dollars. "it will be through a contract to provide jobs for Iraqis and the company pledged to maintenance of existing plants , which helps to provide two thousand megawatts. The statement pointed out that " the contract was signed by the government and the Minister of Electricity Qassim Mohammed Fahdawi and General Electric Company CEO Steve Jolles of the energy sector in the company. Twilight News / she said "GE" It has strengthened its partnerships in Iraq to support and develop the infrastructure of the energy sector in the country, to ensure that meet the growing demand for electricity to the Iraqi people and the various industries in the country. She explained in a statement, responded to Twilight News, he has signed two contracts with the Iraqi Ministry of Electricity and which will contribute to add 2 gigawatts to the national grid, securing about 1.75 gigawatts of available energy in the national grid, to strengthen the infrastructure of the sector. The company has indicated that it will implement the stations of Samawah, Dhi Qar to generate energy with a capacity to add 1500 MW to the Iraqi national grid. And work on the installation of four gas turbines from 9E Statistics session at each site model during the first phase of the project to be completed in 2018. The second phase would include converting the power plant into a combined cycle and provide the latest vapor recovery techniques steam turbine generators, the company also will be the contractor engineering, procurement and construction for the project. She continued that during the second phase of the "plan to increase electricity generation in Iraq" (Father Bauer 2) in cooperation with the Iraqi Ministry of Electricity, will "GE" to add 580 megawatts to the Iraqi national grid through the modernization and reform of the four power stations. In addition, within the framework of the second phase of the "plan to increase electricity generation in Iraq," (Bauer AB 2) the company will help in securing about 1.75 gigawatts of generating capacity in Iraq through the renovation, repair and provide maintenance services on the General Electric turbines 9E model in 6 different power plants in Iraq. It will be for these steps has an important role in enhancing the reliability and energy efficiency in the country. "General Electric" is also working in collaboration with the regional and global financial institutions to secure the necessary funding for the Iraqi government to work on the implementation of these projects and others. Since 2016, the "General Electric" to help Iraq in securing financing for US $ 2 billion for new projects within the energy sector, taking advantage of the large potential in the global supply and strong relations with the most important financiers field, according to the statement. He said Musab teacher official spokesman for the Iraqi Ministry of Electricity: "signed agreements represent the company GE best embodiment of our firm commitment to strengthening the infrastructure of the Gaza electricity generation in the country. The focus of the bulk of our focus on providing continuous electricity resources and the highest reliability and efficiency standards for residential and commercial uses both . offers cooperation with GE model of constructive partnerships between the public and private sectors, where we cooperate with our partners to provide technical solutions and funding to ensure accelerate the completion of projects. " The Declaration of today an extension of the first phase of "a plan to increase electricity generation in Iraq" (Bauer AB 1) for the development of power plants in Iraq, which launched "GE" last year, which contributed to supply more than 700 megawatts of electricity. Said Steve Bowles, President and CEO of the company, "GE Energy President": "We are pleased to continue to strengthen our relations with the Ministry of Electricity to work together to find solutions to provide adequate power to the Iraqi people solutions. Reflects the second phase of a plan to increase electricity generation in Iraq (Bauer's father) the depth of our commitment to providing the latest technical solutions that ensure the smooth continuity of operations in the power plants, in conjunction with achieving unprecedented levels of efficiency in resource consumption. " For his part, Aziz Koleilat, Executive Director of the company "General Electric" in Iraq and Levant, the president said: "I have always been GE from trusted Iraq's partners, and reflect the new agreements our commitment to hard work and continuing to provide the latest technical solutions qualified to enhance the productive capacity of the network of national electricity. We cooperate from this point with relevant public and private sectors in several areas, including providing equipment and financial consulting, to work together to establish a strong infrastructure for the electricity sector in Iraq. in light of the growing demand for electricity resources on an annual basis to keep pace with residential and industrial needs, there is a need to follow transformative approach based on new projects and advanced technical updates. these contracts confirm and reaffirm our commitment to providing comprehensive solutions covering all aspects of working in the energy sector. " And enjoying "GE" a strong presence in Iraq for more than 40 years, and is working to provide support for infrastructure requirements in the energy, oil and gas-generating sectors, water treatment, aviation, health care, through various solutions offered by a strong presence in the country. And it is currently being run more than 130 turbines of "General Electric" in Iraq, in addition to ongoing agreements to support power plants. The company has three offices in Iraq At Baghdad, Erbil and Basra and continue to work to provide the latest technology and expertise to local customers. And working for "GE" are currently more than 250 employees in the country representing the Iraqis citizens about 95% of them. He parliamentary legal committee member Hassan al-Shammari, Friday, put the paragraph in the Ministry of Electricity Act prohibits the ministry of transforming the infrastructure of power plants to the private sector. Al-Shammari said in a statement seen by / balances News /, he "succeeded in convincing the House of Representatives put a paragraph in the Ministry of Electricity Law, the ministry prevented from converting the infrastructure for power plants to the private sector and limit the subject of investment in the creation of new generating stations and the distribution and transmission of electricity." He added, "This will contribute to the protection of citizens from the additional financial implications due to pressing government's policy on citizens financially for the benefit of foreign oil companies, the Council voted on the proposal after the approval of the relevant committee." In continued efforts of the government of Iraq to meet electricity demands, the Ministry of Electricity inked a billion dollar deal with General Electric (GE) for the construction of two power plants, along with technological upgrades and maintenance services. 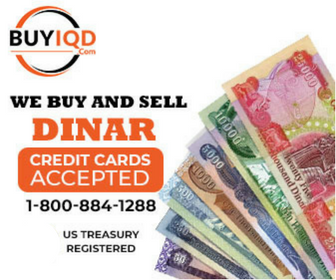 Qassim Mohammed, Iraq’s minister of electricity, signed the $1.4 billion agreement on Thursday in Baghdad, as Prime Minister Haider al-Abadi looked on. According to the United Nations Development Programme, Iraqi households receive 14.6 hours of electricity daily through public or private generators, and 90 percent of households utilize private generators. Iraq's peak electricity demand was 2.1 gigawatts in the summer and the grid is only able to supply about 1.3 gigawatts, Reuters reported last April. The gas-turbine power plants, to be completed by 2018 in the southern provinces of Dhi Qar and Muthannah, will each have a capacity of 750 megawatts, according to GE which announced it had won the bid on January 18. 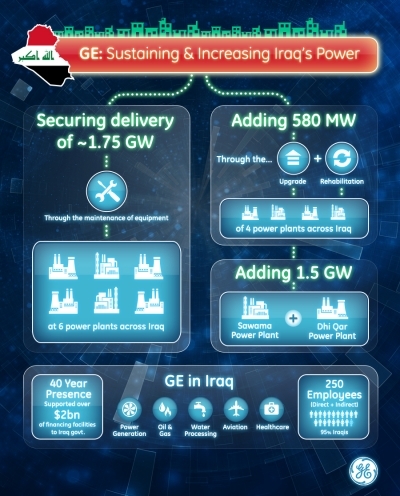 GE added under the terms of the deal that it can sustain about 1.75 gigawatts of power generation through the maintenance of six different gas-turbine power plants, enhancing Iraq’s electricity reliability and efficiency. Additionally, under Phase II of the Power Up Plan, is a joint plan between GE and the ministry for maintenance projects, four unspecified power plants will undergo upgrades and rehabilitation to add over 580 megawatts to the national grid. The deal with GE is also expected to create 1,500 jobs in southern Iraq, according to Abadi’s office. General Electric (GE) has further strengthened its operations in Iraq to support the country’s power infrastructure and to meet the growing need for electricity from people and industries. GE recently signed agreements that will add over 2 gigawatts (GW) of power and secure the delivery of 1.75 GW of existing power to the national grid. GE will set up the Samawa and Dhi Qar power plants, adding 1,500 megawatts (MW) to the grid. In the first phase of the project, GE will install four gas turbines in simple cycle at each site by 2018. The second phase will entail the combined cycle conversion of the turbine units. GE is also supplying advanced heat recovery steam generators (HRSG) and steam turbine technology. It is also serving as the engineering, procurement and construction (EPC) contractor for the projects. Under Power Up Plan Phase II — a plan with the Iraqi Ministry of Electricity (MoE) for critical electricity generation and maintenance projects throughout the country — GE will add over 580 MW to the national grid through upgrade and rehabilitation work at four power plants. Additionally, under Power Up Plan Phase II, GE will sustain — 1.75 GW of existing power generation through the maintenance of the turbines across six different power plants in Iraq. The activities will help enhance the reliability and efficiency of Iraq’s installed base. GE has also been working with regional and international institutions to facilitate financing to help the government of Iraq execute these and other projects. Since 2016, GE has helped the country secure $2 billion in financing for projects in the energy sector leveraging its global sourcing capabilities coupled with its strong relationships with lenders. The announcement builds on GE’s successful delivery of more than 700 megawatts (MW) of additional power through existing power generation infrastructure to the national grid last year as part of the plan’s first phase. GE has over 40 years of presence in Iraq, and supports the country’s infrastructure needs in power generation, oil and gas, water processing, aviation and health care, through diversified multi-business solutions and local presence. Today, more than 130 GE turbines are in operation in Iraq apart from ongoing agreements to support power generation plants across the country. With three offices in Iraq — in Baghdad, Erbil and the southern oil and gas hub of Basra — GE continues to deliver its latest technology and expertise to local customers. The company has created more than 250 employment opportunities in the country, with nearly 95 percent of them filled by Iraqis. Thanks wiljor and yota, this great news. Iraq is modernizing. There really is no other way for Iraq to go but up. Ministry confirmed that the electricity distribution sector in general areas and neighborhoods of the capital will be forwarded to the investment companies before the next summer season. A spokesman for the ministry Musab teacher in a statement the "morning": that "his ministry has achieved great success the issue of assignment of the distribution sector in some areas and the revival of capital investment by private companies, demonstrating saying great satisfaction shown by the citizens of this experiment they are preparing electrocuted on clock versus subsidized by the Ministry of collection rates by 40 percent. He added that the neighborhoods that included this experience in the capital are: "Yarmouk Zayouna and Harithiyah and Mahltan in the university district , along with seven stores in the Amiriyah neighborhood, and Mahltan in Mansour , " stressing that most of the Karkh district zones have been forwarded to the investment companies, revealing that the next few days will refer the new areas on both sides of the Rusafa and Karkh and east of the channel, adding that the ministry plan to refer all areas and neighborhoods of Baghdad before the next summer season. And the implementation of the said project in the provinces, the teacher said that his ministry had succeeded referral distribution networks to invest the provinces of Basra, Missan, Diwaniya, Karbala and Najaf, Babil, and a number of districts and the areas of Wasit province. Also entered into a contract to invest networks distribute the city of Samarra, pointing to the existence of three companies received a distribution of the province of Kirkuk, stressing completed assignments in the provinces before the end of this year.